Pamommy Loves to Run: Running with the crud!!!! Well, everything finally caught up with me and I officially got the crud on Friday morning. Waking up with the sore throat feeling because you can't breathe and drainage and headache and stuffy nose and probably a fever. Last week was busy with sports class, gymnastics swim lessons, end of year parties, graduation and the hubby working very late hours turning me into a single parent some evenings plus three little ones and one big one with the crud too. I tend to be the mommy that is hyper vigilant about washing hands and keeping it away from me but my husband still has not mastered the art of coughing into his elbow or washing his hands a gazillion times so I was done for. Friday evening I managed to eke out a quick 3 miles through the neighborhood but had a hard time breathing, one because the humidity was so high and two because my nose was so stuffy!!! I worked all day Saturday and decided I better give myself the day off and planned to pick back up on Sunday but after a full day of work, a five-year old birthday party and grocery shopping I decided against it once again!! That being said, I feel very sluggish and lazy. No matter what, severe thunderstorms in the forecast for this evening, I will be running. I am one of THOSE crazy runners that goes into withdraws with more than 2 days rest. 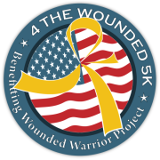 That being said, we have two weeks till the 4 The Wounded 5K in Charlottesville. This is one of the few races that I run with my hubby and he has decided this year he's going to beat me. I've decided this year, I really don't care. I PR'd this race last year and am happy with those results so I think I may just enjoy this race. That all being said now, when race day gets here and my hubby starts talking trash, I may have to step up and beat him. Does anyone compete with their spouse when running together? Anyone go into withdraws when they can't run for more than two day? Saw you on running bloggers:) Sorry your sick, hope you get well soon!! I used to get withdraws when I couldn't run. I have a stupid injury right now, and I have been out for months, there are no words to explain the "withdraws" and just plain want to get out there and run again. Good luck on your 5K over the 4th!